All my kids are a big fan of Egg Tarts, they just love it so much. Each of them can finished up to 3 tarts at one time and sometimes asking for more. One egg tart are selling at 80cents at the market, not to mentioned the one sold in the bakery and see how much I have to spent for just the egg tarts for them. 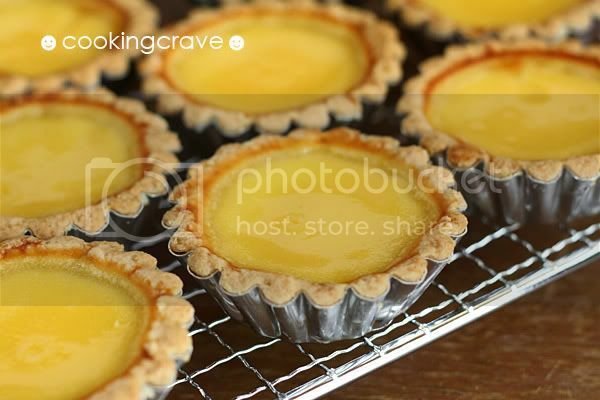 Egg tarts are the must-learn recipe for me and when I came across this easy yet simple egg tart recipe at Let's Get Wokking!, I bookmarked it immediately☻ After getting all the ingredients and the egg tart's mould. I start working on the pastry in the morning and sit them on the fridge first before I sent the kids to the tuition classes. Add egg and mix till it's well combined. Put the dough in a bowl, cover it with cling wrap and keep in the fridge for 30mins. While the dough are refrigerated, whisk the eggs, sugar and custard powder for custard fillings until thick and creamy. Add milk to the mixture and continue to whisk until well-combined. Add water gradually and continue to whisk together. Set aside. Now the crust shall be ready. Weight dough into 30g each (depend to the size of mould used). Roll it into ball, flattened it with our palm and press it into egg tart's mould. It's about 1/2cm thick. Spoon the custard fillings. Becareful not to drop the filling mixture at the side of the crust as it will turn brown when we bake it later. 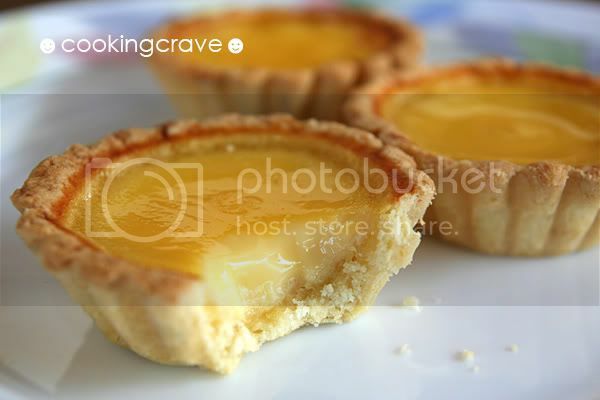 Bake the tarts in preheat oven at 180c for 25 mins, till the crust slightly brown and the egg custard is set. Wait till it's cool before turning the mould upside down to remove them. Notes: I add one tablespoon of custard powder in the filling's mixture to get the more yellow colour of tarts. Don't worry if the filling are still soft when you finished baking the tarts, it'll set when the tarts are slight cool down. Make sure the tarts are cool already when you remove them from the mould. The tarts that's still hot breaks easily. wow..amy...wowo...tintin.. so this blog belongs to u... really.. u r GREAT! i scrolled down and i realize all those food are my favourite..
How do I test whether the egg custard/filling is set before I take it out from oven? Thanks. i've tried this recipe yesterday. The tarts were delicious. However, using my convection oven I reduced the temperature to 150C and baking time to 20 minutes. 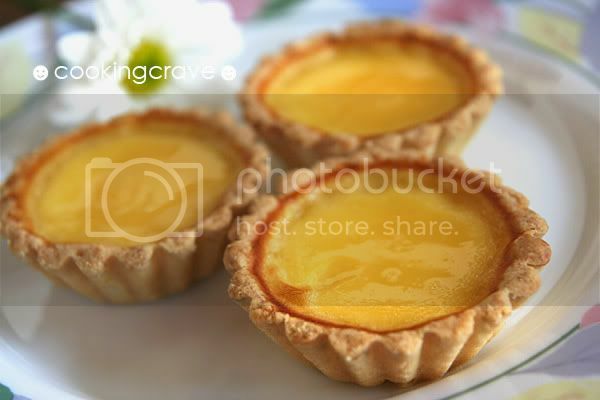 Hi Peace, glad that you have successful make the egg tarts and manage to get the right temperature for baking it. Definitely going to try it soon! Btw, may i know if i need to oil the tart mould before rolling the dough onto it? And how do i take it out of the mould after baking it?